Celebrate National Library Month by stepping outside your media consumption comfort zone and check out something new! 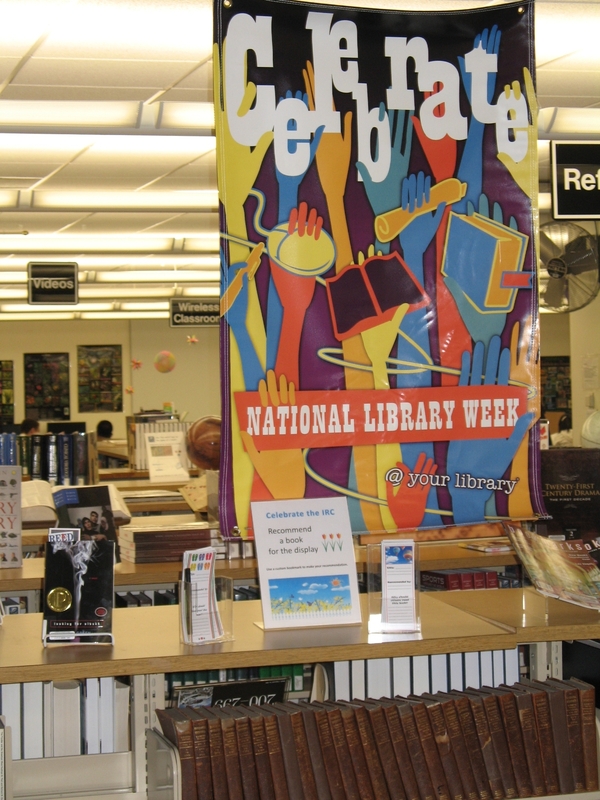 If you’re looking for a good book to read, check out the selection of recommended books from IRC staff and volunteers that are displayed under our beautiful new National Library Month banner. The new book display, which is near the west IRC entrance, is also chock full of good reading. 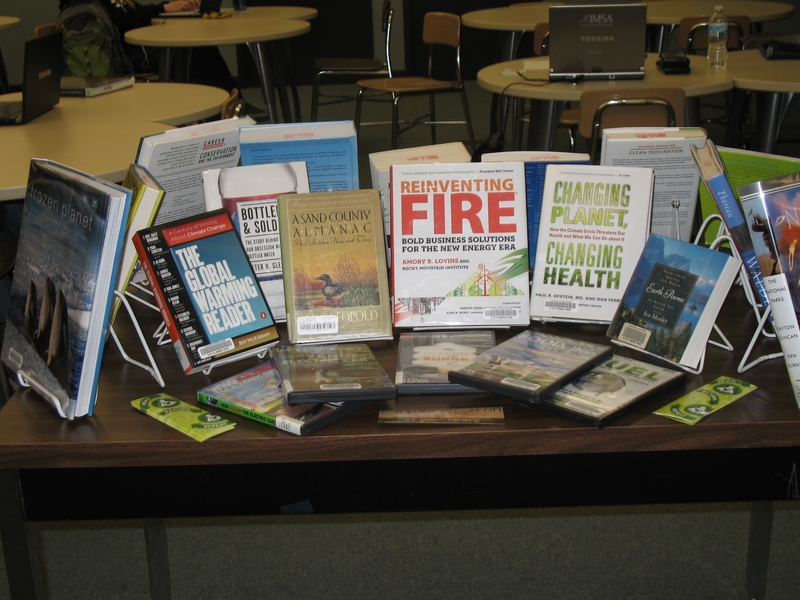 Across from the recommended books display is a table of books and DVDs related to our celebration of Earth Day, which is April 22nd. Don’t forget to stop by our display of new DVDS on the circulation desk, many of which were nominees or winners at this year’s Academy Awards. 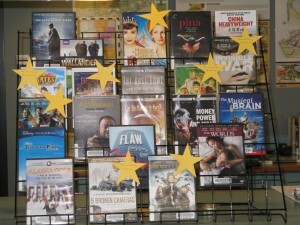 See the “Rave Reviews” section of this blog for a short description of the movies. This entry was posted in Announcements, Displays, Events on April 22, 2013 by nluebke. CELEBRATE POEM IN YOUR POCKET DAY – Select a poem you love, carry it with you and share it with co-workers, family and friends. READ A BOOK OF POETRY – Choose a book from the IRC display or look in the library catalog for your favorite poet’s book. PUT POETRY IN AN UNEXPECTED PLACE – Get creative! Write or copy a poem and put it somewhere for someone to find, maybe on a sidewalk? ENJOY POETRY WITH OTHERS – Attend a poetry reading or read a poem at an open mic. Organize a poetry reading at the library, a coffee shop, bookstore, art gallery, or performance space. Visit the place associated with a favorite poet. It’s a memorable way to pay homage to their life and work. START A POETRY NOTEBOOK ONLINE – Poets.org allows users to build their own portable online commonplace book. This entry was posted in Displays on April 16, 2013 by nluebke. The completion date is the same (April 15th) but we are offering you a chance to have more fun than you’ll have filling out boring old income tax returns. Here’s your chance to let us know how much you like or dislike the selection of books, DVDs and music available from the IRC. If you’re pleased with the service you received during a visit to the IRC – let us know! The names of all who complete the survey will be entered into a drawing for one of 4 prizes. So please take a few minutes and let us know what you think about the IRC. This entry was posted in Displays on April 8, 2013 by nluebke. It’s April – A Time for Celebration in the Library! April is a time for celebration in and acknowledgement of libraries. The whole month has been designated by the American Library Association as Library Snapshot Day, which provides a way for all libraries to show what happens in a single day in their libraries. We’ll be posting a photo on the blog each week in April to highlight activities in the IRC and celebrate Library Snapshot Day. 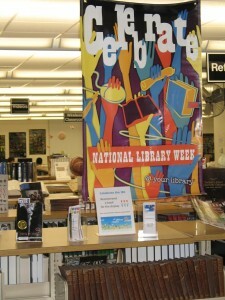 We’ll also be celebrating National Library Week the week of April 14th. This is a national observance to celebrate the contributions of our nation’s libraries (school, public, academic, and special), and librarians and to promote library use and support. National Library Workers Day falls on the Tuesday of National Library Week, and the purpose is to recognize all library workers, including librarians, support staff and others who make library service possible every day. 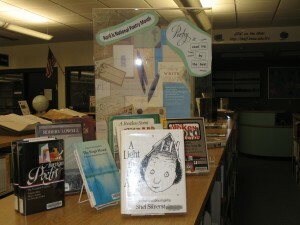 The concept of Library Snapshot Day began in New Jersey as a joint effort between the New Jersey Library Association and the New Jersey State Library. 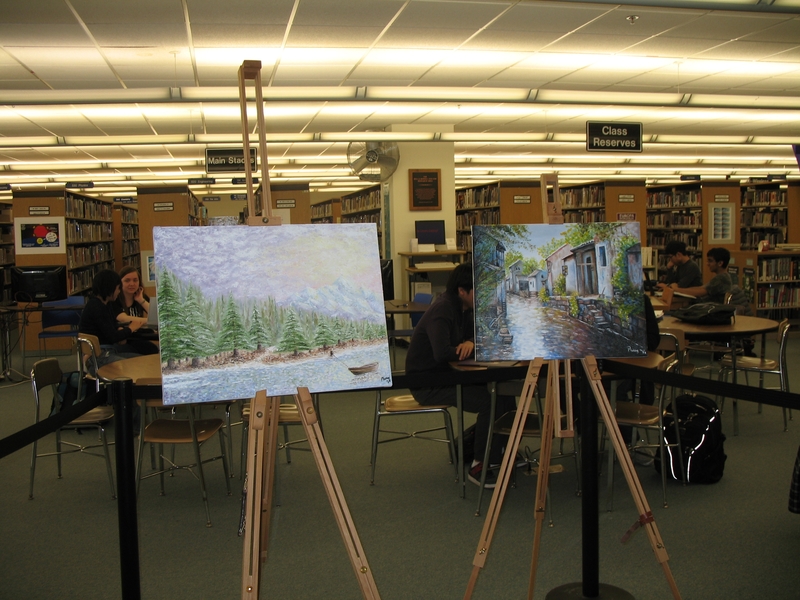 Enjoy this week’s Library Snapshot of two paintings by IMSA student Phuong Vo. These lovely paintings enhance our library and remind us all that the IRC at IMSA is a place where art is celebrated. This entry was posted in Displays on April 3, 2013 by nluebke.